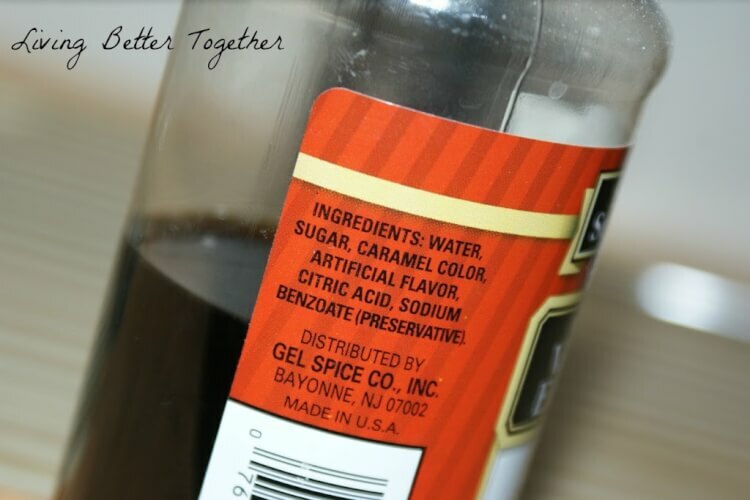 Vanilla Extract is made from Alcohol and Vanilla Beans… do you see either of those listed… yeah, my point exactly! Did you know that during prohibition, women used to actually drink vanilla extract straight out of the bottle to get drunk… yup… I’m pretty sure they couldn’t have done that with sugar water. So I decided I was going to make my own, real vanilla extract. I purchased Madagascar Vanilla Beans here, Vanilla Beans are pretty expensive, and believe it or not this is a really good price. There are several different kinds of vanilla beans, I chose the the Madagascar beans because they have a dark, rich, creamy, sweet, and buttery flavor. 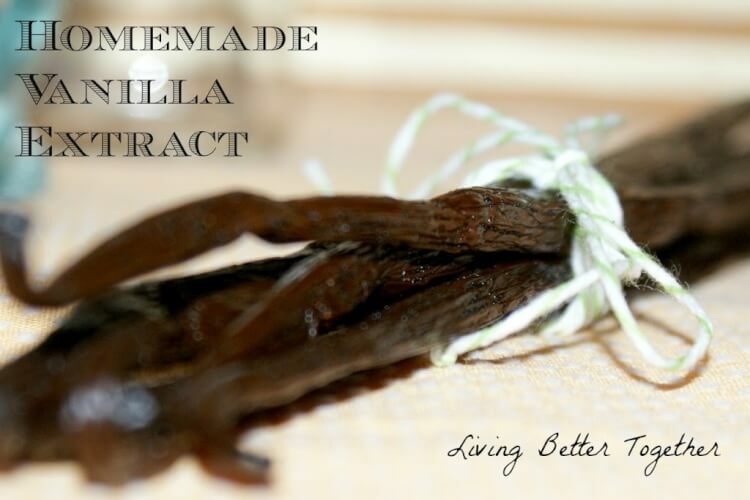 You can read about the other types of vanilla beans here. I picked up a bottle of mid grade vodka… though any grade will work. 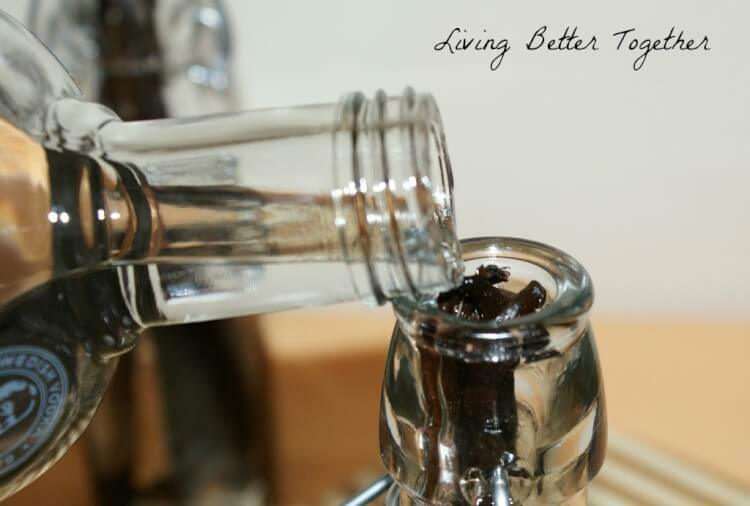 You can also use rum, brandy, or bourbon to make vanilla extract. I chose vodka because it had a cleaner taste and won’t change the flavor much. You will also need resealable bottles around 8 – 12 oz., I got mine at TJMaxx and Marshall’s, they are usually about $2.00 – $3.00 each. 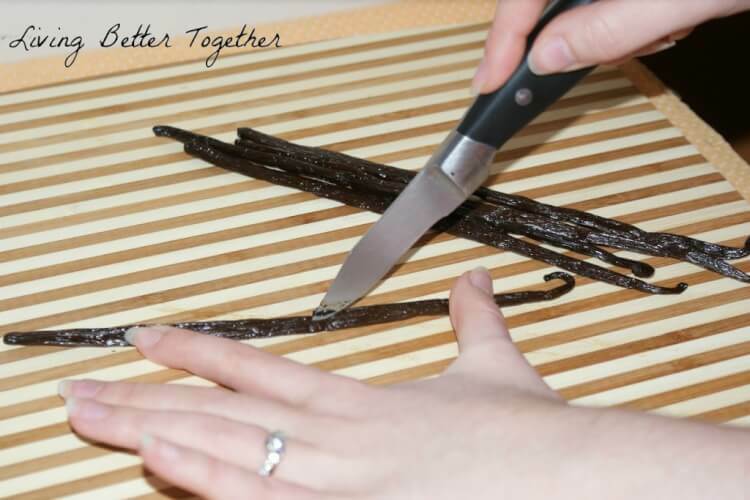 Begin by slicing the Vanilla Beans length wise, you do not want to slice them in half, you just want to open them up. 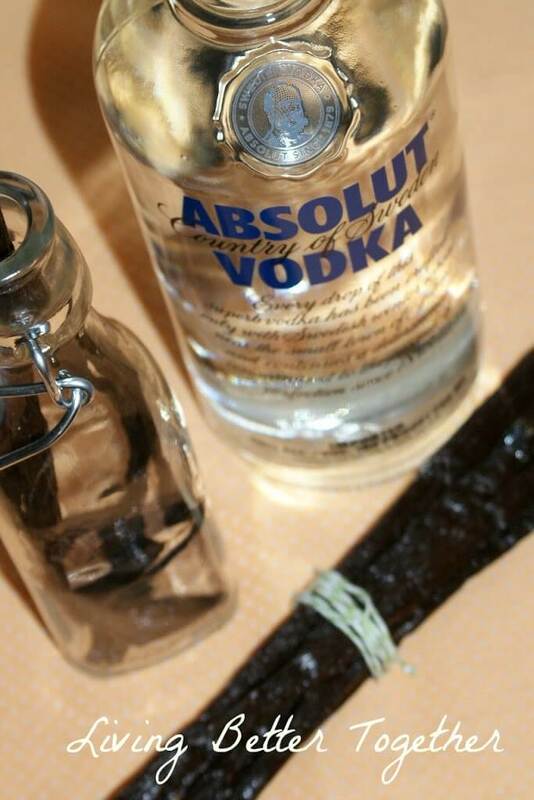 Put the sliced vanilla beans in the bottles (5 per bottle). 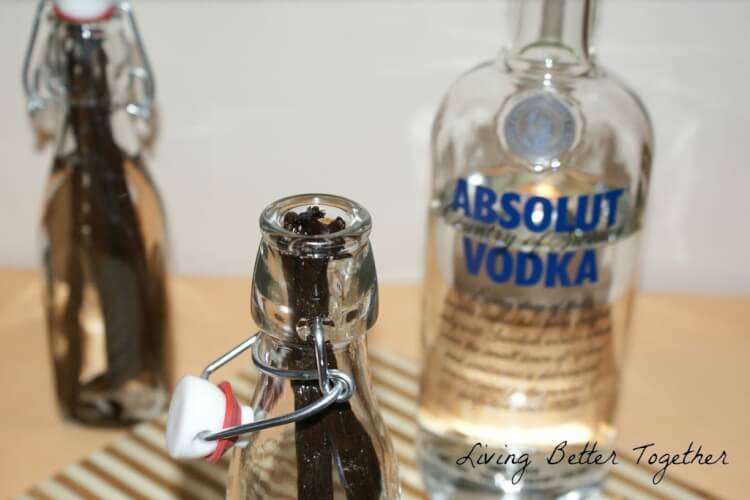 Fill the bottle with vodka to about an inch from the top. Now comes the hard part, waiting at least eight weeks before popping it open for some baking! This would make a great gift, especially as an addition to a housewarming basket. I plan to decorate the bottles all up and will shared more pictures when they finish brewing! 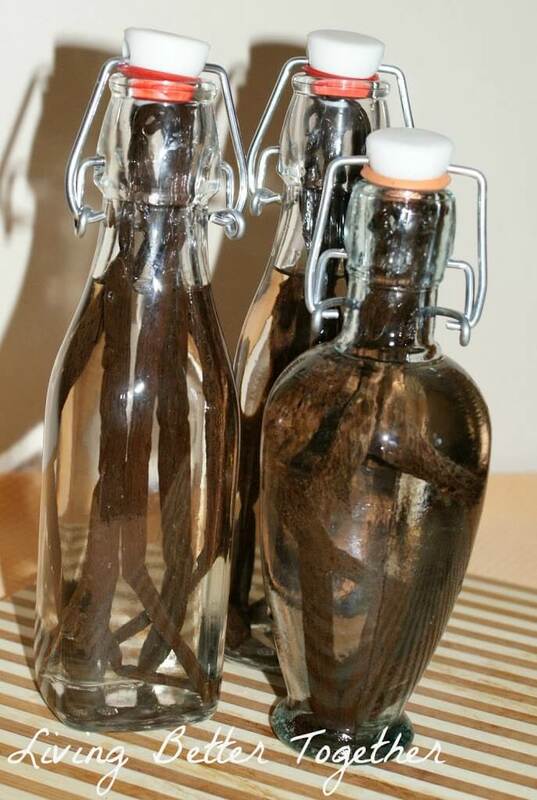 I have been collecting vanilla beans until I have enough to make real vanilla extract. I have 4. 😉 Thank you for the how-to! You are most welcome! Stay tuned, I plan on making Vanilla Sugar with the vanilla beans after the extract is done brewing. I love being able to use every last bit of something.